Maybe for Morgan Spurlock, making a successful documentary just means finding an appropriate subject to match his unvarying tone. His signature perky, concerned-yet-playful approach seemed insultingly frivolous when dealing with terrorism and the Middle East in Where In The World Is Osama Bin Laden?, or with racial stereotypes in his segment of Freakonomics. But given the less charged topics of fast-food industry practices and American health in his breakout film, Super Size Me, that style was disarming and accessible, expressing a real problem without heavy-handed moralizing or self-importance. Similarly, in his new doc, The Greatest Movie Ever Sold, it’s a lighthearted platform for a discursive essay on product placement in modern media. Spurlock isn’t out to change the advertising world—he’s just poking around a discussion topic. The results are scattershot but entertaining, and occasionally eye-opening. 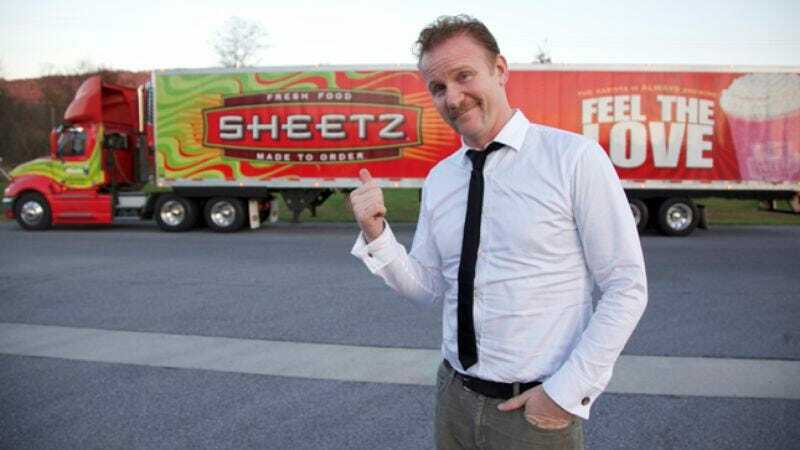 Spurlock starts out by seeking companies to fund Greatest Movie in exchange for product placement; for a while, the movie follows his hopeful cold calls and hilariously shameless pitches. (Spoiler: the movie’s full title indicates his eventual biggest corporate ally.) Once he does net some bucks, the story wanders. Spurlock reveals what his sponsors expect in return for their investments—their contractual demands range from final cut on Greatest Movie to ads inserted into the film to a requirement not to disparage Germany. He briefly talks to directors who discuss their adventures in product placement (Peter Berg, J.J. Abrams, Brett Ratner) or lack thereof (Quentin Tarantino, who wanted key Pulp Fiction and Reservoir Dogs scenes to take place in Denny’s, but couldn’t get the chain on board). He visits one company to analyze and position “the Morgan Spurlock brand,” and another that tests film trailers by watching viewers’ reactions via MRI. He chats with Ralph Nader and Noam Chomsky about selling out, and visits a school that’s compensating for budget cuts by selling ad space on busses and school property. It’s all gimmicky, disconnected, and unfocused, but it still amounts to a lively essay on advertising that lands somewhere between investigative journalism and a lightweight lifestyle blog. Ultimately, Spurlock isn’t offering major conclusions, calls to action, or even a muckraking exposé of the advertising industry: He’s just out to offer people an irreverent look at what goes into product placement, without demanding undue concern about it. Still, he scores a strong moment when he visits São Paulo, Brazil after a ban on outdoor advertising goes into effect, and his cameras capture a world startlingly naked of garish billboards and demands for corporate loyalty. Spurlock doesn’t demand a world without advertising, but he does suggest that noticing it is the first step toward pondering what the world might be like with considerably less of it.